The chairman of the Senate Homeland Security Committee is asking the FBI about “highly questionable” redactions in text messages exchanged between two bureau officials who worked on the Hillary Clinton and Trump campaign investigations. Johnson singled out one October 2016 text message that suggested that FBI counterintelligence official Peter Strzok was locked in a battle with another government official over a secret surveillance warrant. In another July 2016 text, Strzok suggested that the FBI lacked the resources to conduct a thorough investigation of Hillary Clinton’s use of a private email server. The bureau also redacted text messages about the Hillary Clinton email investigation. 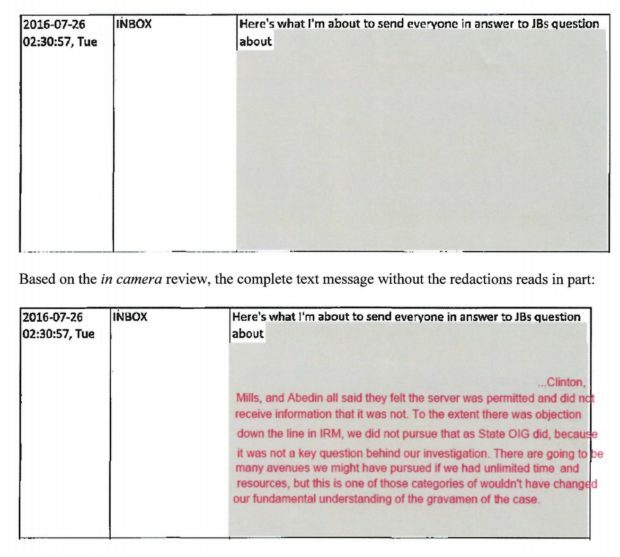 Johnson flagged one heavily redacted text message that Strzok sent to Page on July 26, 2016. In it, Strzok suggested the FBI would have conducted a more thorough investigation of Clinton’s use of a private email server if the bureau had more resources.